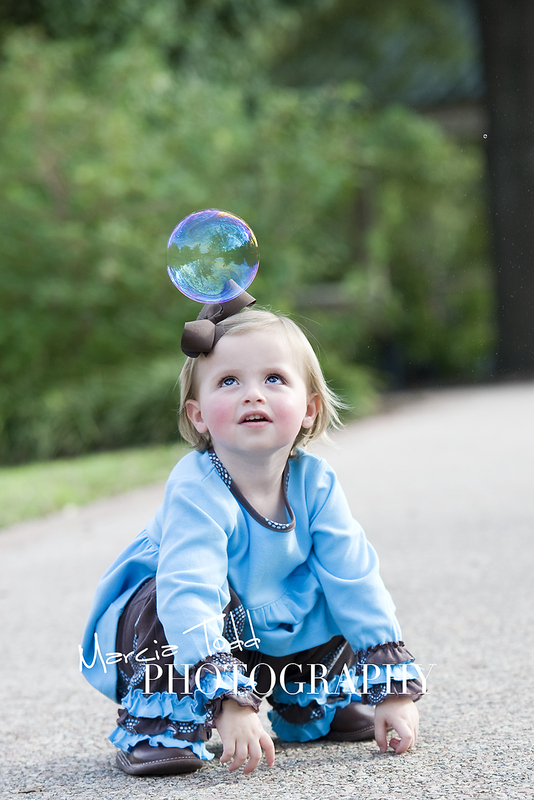 MARCIA TODD PHOTOGRAPHY: Good things come to those who wait! Tiffany was the portrait party host and has been waiting patiently as I have been posting all of her guest's galleries in anticipation of her little girl's photos. I first met Avery 6 months ago at another portrait party. Avery wrapped up my day with her sweet smile, rosie cheeks & adorable outfits. I gasped and then "awww" when I saw this shot. I would love to say I planned it, but I was in the right place at the right time. This just happened. Not only do I love the way she is squatted down and gazing at that bubble, but also the fact that I can see the moisture still in the air from the bubble solution. I'm a photographer - I pay attention to detail!